For All the World to See: Visual Culture and the Struggle for Civil Rights is an extensive exhibit that chronicles how the media and visual culture transformed and shaped the struggle for racial equality by publicizing the realities of segregation and racial violence, and inspiring the activists who fought for racial equality. The exhibition tells the story through an extensive collection of photographs, television clips, art posters, and historic artifacts. 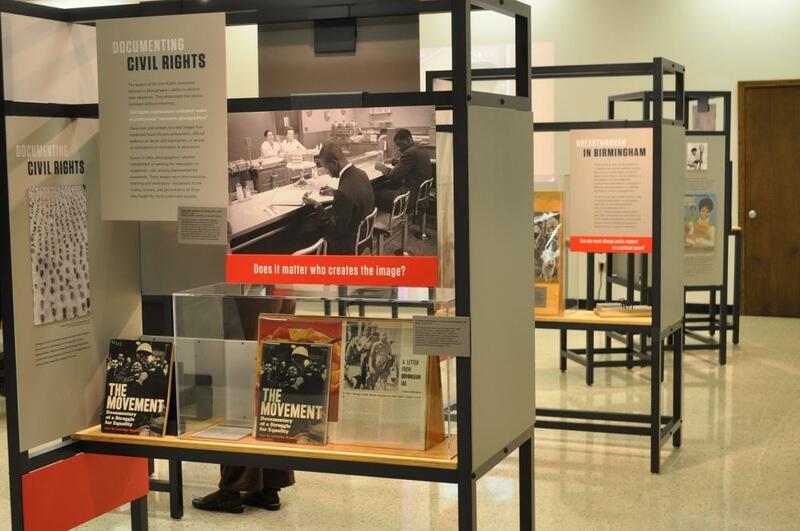 Visitors are able to track the development of the civil rights movement from the 1940s through the 1970s by examining 250 objects assembled by curator Maurice Berger. The collection covers both negative and positive imagery—from Aunt Jemima advertisements to footage of Jackie Robinson’s first major league game—exploring how these potent images influenced the perceptions of race and the struggle for equality in America. Highlights of the exhibit include images from the Selma marches, early editions of Ebony and Jet, and materials documenting the birth of the Black Power movement. You can find many images from For All the World to See in a comprehensive online exhibition. For All the World to See was supported by grants from the National Endowment for the Humanities and organized by the Center for Art, Design and Visual Culture at the University of Maryland, Baltimore County, and the Smithsonian National Museum of African American History and Culture in Washington, DC. The original exhibition toured venues across the country from January 2011 through July 2013. A scaled-down NEH on the Road version of the original exhibit is now touring and available for booking here. The University of Texas at San Antonio will host the NEH on the Road exhibition from January 28 through March 16. A full schedule for the exhibit is available online.